We are offering Kids Study Table Set to our clients. 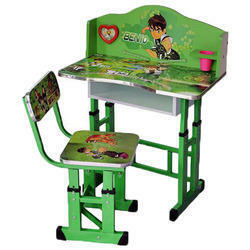 For meeting different requirements of our valuable patrons, our company has been engaged in the manufacturing, trading and supplying of Kids Benches. These benches are extensively used in play group, primary schools, children parks and many more places. Offered products are colorful and attractive at the same time due to which their demand is growing rapidly in the market. Exclusive Champion Racer Series for Boy's Bedroom from Champion Racer Kids Furniture. We design and make furniture for kids as per their age and requirement so that they can feel charming & comfortable in thier personal den.